A dog survived a 250ft fall, almost the height of Big Ben, with no broken bones after plunging off a cliff as he chased a rabbit. Norman, a one-year-old Weimaraner, had been taken for a walk along the White Cliffs of Dover when he suddenly darted off towards the edge after a bunny. Owners Simon Spore and fiancee Jane Westfield’s dog was being walked by Miss Westfield’s 19-year-old son Josh as the couple went shopping Canterbury. The next they heard was when Josh called them to say Norman had chased a rabbit over the edge of the cliffs and plunged 250ft in a dock service yard below. Dock workers ran to the dog’s side and he was rushed to a local vets for treatment. Norman suffered no broken bones, despite falling the huge distance – almost the height of Big Ben, which stands at 314ft. Owner Mr Spore, 49, a prison officer from Dover, Kent, said he was “reeling in shock” when Josh called him to say his pet had gone over the edge of the cliffs chasing a rabbit. “I was absolutely distraught. Josh was in total shock,” he said. “In my mind I was going back to retrieve a dead dog. After two nights in the vets last week Norman was allowed home and is now recovering. A posting on Norman’s own Facebook page reads: “I’m feeling bit better today – I don’t want any walks ever again to high places. German authorities are hunting high and low for a kangaroo that escaped from an animal park near Frankfurt, with the help of a fox and wild boar. Three kangaroos named Skippy, Jack and Mick on Saturday night bounded through a hole in the fence of their enclosure made by a helpful fox, Michael Hoffmann, deputy head of the animal park near Frankfurt, said. One unadventurously stayed within the park grounds and was swiftly recaptured. The other two scrabbled to freedom through a hole dug by a wild boar under the park’s exterior barriers. Vets snared one of the refugee pair after a long chase, Mr Hoffmann said, but the third had proved harder to track down. The animal is no danger to the public, stressed Mr Hoffmann. First Squirrels now FISH! Why do animals like KitKats so much? A fish raised on Kit-Kats is being forced to give them a break after getting too big for his tank. The fatso fish is named Gary, and he’s a 15.7-inch, 8.8-pound gourami, an exotic Asian freshwater fish that is considered a delicacy in Indonesia. Gary was in the care of a private owner until he was donated to the SeaLife Aquarium in London after becoming too large, a common fate for many domesticated fish, according to center spokeswoman Rebecca Carter. However, despite being supersized, Gary was not eating the normal aquarium fare he was being served. Officials were perplexed until they checked with the previous owners and discovered he had been raised strictly on a diet of Kit-Kat candybars. Aquarium employees tried to give Gary a taste of normal gourami food by stuffing Kit-Kat crumbles into grapes before shutting this chocoholic fish off cold turkey. He’s not eating sweets anymore, but he is getting a taste of fame. The aquarium is now featuring Gary in an exhibit called “Tank Busters” that showcases a number of large fish that simply grew too big for their owners to manage. ohn Costantino a aquarist based in Austin, Tex., says gouramis are notorious in the fish hobbyist world for getting too big for most owners. “We call them ‘yo-yo fish’ and ‘boomerang fish’ because people will buy them and return them,” he told HuffPost Weird News. Like Carter, he’s never heard of a fish who was sweet on chocolate. “However, some people feed their fish cat food, baby mice or cockroaches just for kicks,” he said. This is the terrifying moment a cloud threatened to develop into a full blown tornado over a row of family homes. Brave snapper Pat Kavanagh took this shot of an explosive black storm from the roof of his house in Taber, Canada last month. Expecting the sunny weather to take a turn for the worse he watched intently as the billows started spinning into a furious funnel. The dad-of-three said: “It was a nice evening and the sun was shining when I suddenly heard claps of thunder which was strange. “My wife went to look out the front door and saw the clouds blowing up from the south. I took one look and headed back into the house to get my camera. “We watched the storm for a few minutes when I noticed that the cloud was starting to spin. I got my ladder and climbed up on my roof to get a better view. Tornadoes are very unusual in Taber so this picture taken on July 17 was a once in a lifetime sighting for the Human Resource manager. A French chocolatier has created a ten-metre-high chocolate Christmas tree in his laboratory in Paris. Patrick Roger’s creation will be used to raise funds for a television charity event to support research into neuromuscular diseases. The tree, which is currently towering inside the chocolatier’s factory in Sceaux, weighs four tonnes and according to Mr Roger’s is a piece of “architecture”. Nuts and berries – who needs ’em, eh? 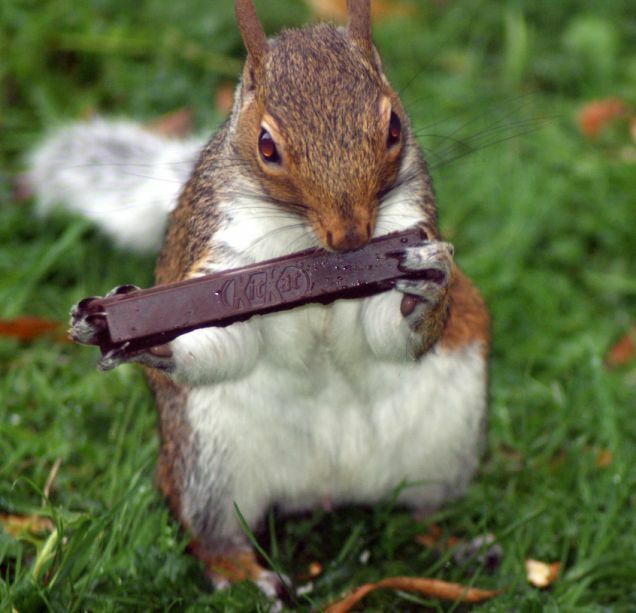 So says a sugar-loving squirrel snapped in a York park chowing down on a KitKat. As anyone fond of the classic Nestlé snack will attest, the best way to eat it is by nibbling the chocolate off the sides before digging into the wafery goodness within – so extra marks to our furry friend for evidently following tradition. The snack-happy critter was spotted near York’s Rowntree Park by an anonymous pensioner, who promptly relayed his findings to The Press newspaper. ‘It had come from the park,’ he said of the squirrel. There have been suggestions the animal was drawn to the snack because the wrapper warned that it ‘may contain nuts’, but such speculation is, of course, impossible to corroborate. Is it wrong to assume the little dude was simply having a break, like the rest of us? LONDON, – British artist Lennie Payne says he first thought about working with bread after making shapes with toast to entertain his daughter at breakfast. 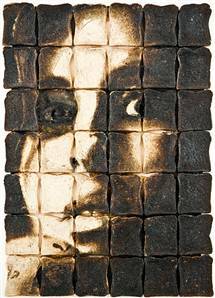 That was 14 years ago, now the 46-year-old Payne is selling his portraits of famous faces such as Kate Moss and Barack Obama branded onto slices of bread for at least 5,000 pounds ($7,734) apiece. 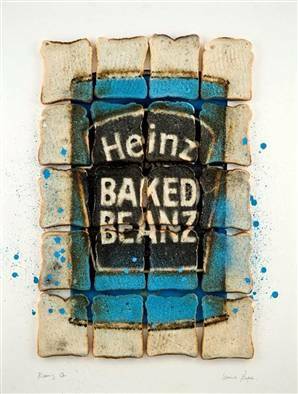 Payne views bread as an exciting, constantly changing medium and as a metaphor for “the basic human need for survival and a great way to look into the spirituality of every day life” he told Reuters while putting the finishing touches to the show. Many of the works on display are portraits of rock musicians such as Ian Brown or Noel Gallagher but the show also features a Gandhi portrait as well as anonymous faces of starving people. It is both a meditation on the obsession of the media with celebrity and an attempt to reveal the human being behind the famous face. There is for instance a striking black and white portrait of a haunted-looking Amy Winehouse. Born in 1964, in Hammersmith, London, Payne is no stranger to human sufferings. Adopted when he was a child by a very religious family, he was diagnosed with epilepsy during his teens. When the fits worsened, he sought refuge in drugs and alcohol. Prison and depression followed. Through the ordeal, he said he kept a burning desire to create. Self-taught, he experimented with many mediums before turning to toast art. Considered as a founder of the discipline, he has built a reputation with critics and collectors. He recently hooked up with a patron, the Donnellys, founders of trendy British fashion label Gio Goi, who are branching out into art. Most of the time he uses a blowtorch to scorch the bread and turn it black, and then he scraps away the burnt bread to create different shades. “If you burn it as it’s fresh, which I like to do, you get a lot of dark and smoke effect. After, the bread needs to be flattened, it needs to shrink and obviously the picture changes,” he said. Then the bread is lacquered and a resin is soaked in. Payne has been experimenting with resin and bread crumbs lately and the often stunning results can be seen at the show. The next step will be to mix toast with other mediums, possibly objects, and start work on some installations, he said. One downside to working with a food product, Payne discovered a few years ago was that his work attracted unwanted fans. When he sent a portrait of Ian Dury away to be framed for an exhibition, he received a phone call from the framer saying the mice had eaten part of the toast canvas. Payne had to work frantically to replace the lost pieces to make his deadline. “Now the paintings go to the framer already sealed,” he said.